Mega Sale! 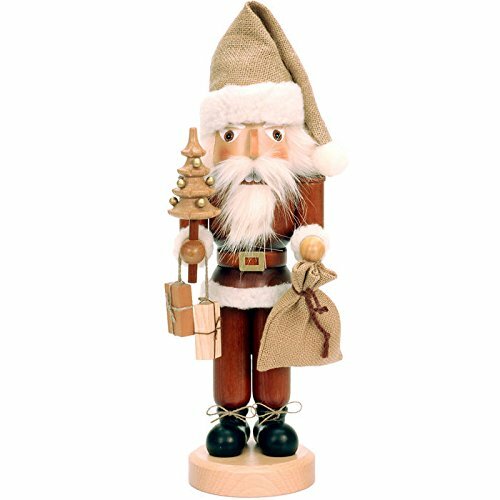 Save 29% on the Alexander Taron Importer 32-333 This Ulbricht/Seiffener Santa Nutcracker Is Holding a Christmas Tree an d a Sack Of Presents an d Is in Natural Wood Finish. by Alexander Taron Importer at Two Clock. MPN: 10366. Hurry! Limited time offer. Offer valid only while supplies last. Bearing gifts and an air of Christmas charm, the Christian Ulbricht Santa with Christmas Tree Nutcracker is the perfect addition this holiday season. Bearing gifts and an air of Christmas charm, the Christian Ulbricht Santa with Christmas Tree Nutcracker is the perfect addition this holiday season. This classic Santa nutcracker is detailed to perfection and operates like a dream. It's skillfully crafted by artisans in Germany. For more than half a century, the Taron Company has been delighting customers and collectors with traditional European gifts. These exquisite hand-crafted products range from nutcrackers and incense burners to ornaments and cuckoo clocks; unique and collectible, they make unforgettable gifts regardless the occasion. Originally founded in 1949, Alexander Taron remains dedicated to providing high-quality items at great value. Dimensions: 5.5W x 5D x 16.5H in.. Wood construction. Natural finish with painted details. Single piece. Handmade in Germany.